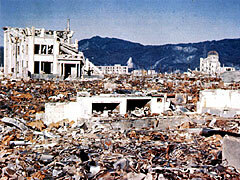 Hiroshima was in ruins. The T-bridge's barriers had been knocked awry; utility poles stood at odd angles, and familiar landmarks were gone or unrecognizable. Buildings—even strong modern structures—had suffered significant damage, some pushed off their foundations, some gutted by fire, others utterly destroyed. Many steel and concrete buildings appeared intact at first glance, but their outer walls hid internal damage due to the downward pressure of the air burst. Cemeteries were uprooted, and churches had become rubble.